Canada's The New Jacobin Club may be the best-kept secret of the theatrical Gothic scene. The Saskatoon-based outfit has been lighting the stages of Western Canada on fire (quite literally) for more than fifteen years now, during which time they've also released a handful of albums that run the gamut from punk to industrial metal. 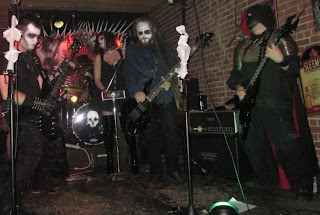 The constant, however, is the dark visuals that comprise the ensemble's outrageous live performances. Besides the core members' ghoulish costumery, a performance troupe known as The Angry Teeth Freakshow take The New Jacobin Club's stage presence to titillating heights of debauchery. Theatrics aside, though, the band's latest effort This Treason stands solidly on its own merits as an entertaining conceptual blend of horror punk and Gothic metal, having an intriguing historical event as the source of the lyrical content. Rarely does fiction outdo reality when it comes to collusion, mystery, and immorality. Frontman Xerxes Praetorius Horde (The Horde, for short) turned to the 14th-century and Isabella of France's traitorous invasion of England for This Treason's lyrical inspiration, effectively mining the court intrigue and shifting alliances that ruled the day. The band's website has a very detailed narrative to accompany the album, adding a level of depth to the listening experience that few bands make the effort to provide. As a history buff with a particular interest in medieval Europe, that scores points with me. 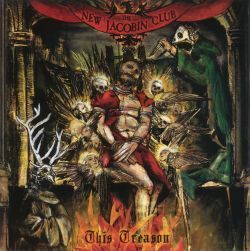 The root of The New Jacobin Club's sound, as I mentioned, lies somewhere between psychobilly and straightforward metal. The Horde's vocal style is, predominantly, straight out of the Glenn Danzig (Misfits era) tradition - though much more engaging than Danzig ever was. Most of the punk vibe is derived from this style, and at times The Horde branches off into a more metallic delivery ranging from blackened shrieks to gurgling growls. "The Fall", however, finds him squarely in the screamo camp which makes that particular track a low point for me despite a strong bass presence, a noodling solo, and the overall excellent use of tension. The bass on This Treason is quite extraordinary, with The Swarm's grumbling lines nearly always wrecking havoc near the top of the mix. Although never fancy, The Swarm's presence ably weighs down the capable riffs put forth by The Horde and fellow axeman The Fury. Wielding the lead guitar role, The Fury does an admirable job laying down some extended solos and sizzling leads (particularly on "Countess Scorned" and the instrumental "Kronos Devours His Children") and often joins with The Horde for some blues-based, foot-tapping riffs. Songs such as "Like Dogs" and "Private Hell" manage to implant themselves in memory thanks to some groovy riffs courtesy of The New Jacobin Club's two six-stringers. The Gothic elements of This Treason are derived mostly from Vitruvius' keyboards and The Luminous' electric cello. The lengthy "All Mourning Long", one of This Treason's standout tracks, benefits from a well-arranged synth atmosphere that nicely compliments the grim vocals and menacing riffs. The mournful strings on "Breath Like Wine" work well with the folkish cadence and melodic riffs, making this mid-paced track another album highlight. With all that This Treason has to offer, some aspects do more to distract and irritate than enhance what is certainly an enjoyable album. 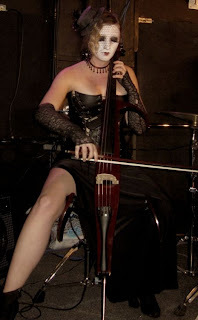 The band chooses to inject the theremin (played by Poison Candy) into the mix on several occasions, resulting an a sort of UFO-ish tone that annoyingly detracts from everything else going on during those moments. This Treason closes out with a hidden track that is essentially an '80s synth-pop remix of "Breath Like Wine", which is a fun listen, but the five minutes of silence preceding the song is a bothersome gimmick. Nicely packaged with a bonus DVD containing concert footage, videos and interviews, This Treason is an album that fans of theatrical shock rock/metal should further investigate. If you ever wondered what Gwar's interpretation of The Rocky Horror Picture Show might be like, The New Jacobin Club has your answer.